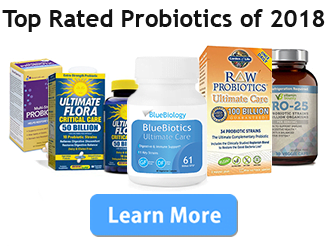 Ultimate Flora tested significantly higher than the majority of general probiotic blends. However, our lab results weren’t as positive as with BlueBiotics and we found that the amounts of actual live and active cultures were effectively less than our top pick. However, these probiotics have a very high, diverse strain count which makes this product ideal for those who do not have any pressing health issues, but are looking for a solid general supplement for well-being. Ultimate Flora Critical Care is a diverse probiotic blend. The benefits associated with the specific strains include: increased nutrient uptake from all sources and increased metabolism; as well as a reduction in symptoms such as upset stomach, diarrhea, constipation, and any antibiotic-associated symptoms. The cultures in Ultimate Flora Critical Care reduce the likelihood of bacterial infections within the sinuses and throughout the digestive tract. Lastly, Ultimate Flora Critical Care contains Lactobacillus bulgaricus, which helps those who suffer from lactose intolerance. Ultimate Flora is composed of very well-documented probiotic strains and is an effective addition to any lifestyle, capable of conferring a wide variety of health benefits. The probiotic strains are not only diverse, they were also resilient to outside influences and, in many cases, were successful in establishing colonies within the digestive tracts of study participants. Individuals participating in our studies also reported significant weight loss and moderate positive gains in overall musculature. This product is safe for pets and children, but it is always wise to consult a physician before taking any supplement if you are pregnant or nursing. Despite the hefty CFU advertised by Ultimate Flora, a large portion of the probiotic colonies were no longer alive upon analysis. This resulted in the effective CFU being roughly half of what was claimed by the product. The result was a compromise in the integrity of the overall product, although it must be said that even at half of the claimed value the CFU still scores well within the upper spectrum of general probiotics. Also, check out our Top Probiotics of 2017 reviews right here.